General Dynamics NASSCO constructed the three ECO-class tankers for SEA-Vista. Photo courtesy of General Dynamics. The keel-laying ceremony for the first ECO-class tanker for SEA-Vista was held in May 2015. Photo courtesy of NASSCO. Construction of the third tanker was initiated in October 2015. Photo courtesy of NASSCO. The three tanks were delivered in April 2016, November 2016 and March 2017 respectively. Photo courtesy of NASSCO. The Sea-Vista Eco-class product tankers were constructed by General Dynamics NASSCO, a wholly-owned subsidiary of General Dynamics, for SEA-Vista Newbuild II, a joint venture (JV) between Avista Capital Partners and Seabulk Tankers, which is a wholly-owned subsidiary of SEACOR Holdings. Ohio product tanker is first of the four new Jones Act product tankers built by Aker Philadelphia Shipyard (APSI), a wholly owned US subsidiary of Aker Philadelphia Shipyard. The two companies formed the JV by signing a contract in 2014. Avista invested approximately $150m for a non-controlling ownership interest in SEACOR subsidiaries, along with the construction contract of three product tankers with NASSCO. The three vessels, namely the Independence, the Constitution and the Liberty, were constructed according to the Jones Act trade requirements at the NASSCO shipyard in San Diego, and delivered in April 2016, November 2016 and March 2017 respectively. As stipulated in the ship management and crew management agreements, the vessels are being managed and crewed by SEACOR subsidiaries. The Independence, the Constitution and the Liberty are addressing the transportation requirements for crude oil and refined product volumes in the US. The ECO-class tanker programme includes the construction of eight tanker vessels, the last one being the Palmetto State, which was delivered in June 2017, marking the completion of the ECO-class programme. The tankers are meant for two separate customers, namely SEA-Vista and American Petroleum Tankers. 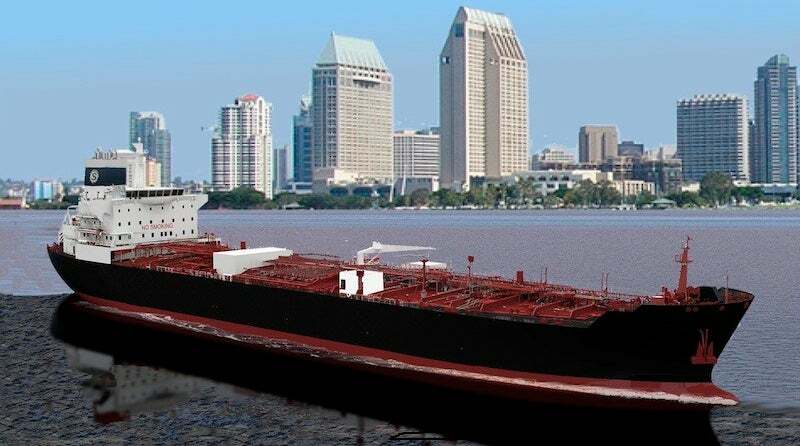 General Dynamics NASSCO signed a contract with Seabulk Tankers for the design and construction of two 50,000dwt LNG conversion-ready product tankers plus an option for an additional tanker, in September 2013. The construction of the first product tanker was initiated in November 2014, while its keel-laying ceremony was held in May 2015. Construction of the second and third product tankers began in June and October 2015 respectively. Designed by Daewoo Shipbuilding and Marine Engineering (DSME) subsidiary DSEC, the Sea-Vista product tankers incorporate the ECO MR (medium-range) tanker design, which allows for the installation of LNG fuel-gas system and tanks in future. The ECO design enables the tankers to achieve improved fuel efficiency through features such as a G-series MAN ME slow-speed main engine and an optimised hull form. The tankers feature the latest environmental protection systems, including a ballast water treatment system, placing them among the world’s most fuel-efficient and eco-friendly tankers. The vessels have an overall length of 186m, length between perpendiculars (LBP) of 178m, depth of 19.1m and moulded breadth of 32.2m. The design draught is 11m and scantling draught is 13.3m. Each tanker weighs 50,000dwt and has a 330,000 barrel cargo capacity. "The Independence, the Constitution and the Liberty are built to address the transportation requirements for crude oil and refined product volumes in the US." The vessels are classified as the American Bureau of Shipping (ABS) class notations of +A1, Oil and Chemical Carrier, IMO Ship Type 3, ESP, CSR, AB-CM, CPS, +AMS, +ACCU, VEC, VEC-L, TCM, PMA+, GP, UWILD, SH, NBL, SHCM, and BWT. Sea-Vista tankers also feature cargo tanks for storage, which are divided into six groups, in addition to slop tanks to carry approximately 53,700m³ (337,000 barrels) of liquid products. The ECO-class is powered by a set of conversion-capable, dual-fuel-capable G-series MAN ME slow-speed, auxiliary, main engine. It has a maximum continuous rating (MCR) of 7,700kW at 90.3rpm and nominal continuous rating (NCR) of 5,775kW at 82rpm. The daily fuel oil consumption (DFOC) of the vessels at NCR is approximately 22.2t/d. The tankers have a service speed of 14.5k at design draft and a cruising range of 10,200nmi. The on-board electricity is supplied by three 1,240kW diesel generator sets. Choice Ballast Solutions (Choice) provides programmes and services to vessel owners, ship management operators, and ballast water management system suppliers. Our programmes and services include planning and evaluation services, integration engineering, certification services, and vessel services for ballast water treatment systems.